BANGKOK — Greenpeace has ended a five-year truce with one of the world's largest paper companies, accusing it of cutting down tropical forests in Indonesia during the entire time the two were cooperating on conservation. The announcement Wednesday, triggered by an Associated Press investigation, abruptly ends a landmark 2013 agreement in which the environmental group suspended a global campaign against Indonesia's Sinarmas and its Asia Pulp & Paper arm in exchange for commitments to end deforestation, land grabs and conflicts with local communities. The campaign had linked the company's destruction of forests in Indonesia to boxes used to package Barbie dolls, causing Sinarmas to hemorrhage important customers including Barbie maker Mattel, Xerox, Danone and KFC. Following AP's stories in December, Greenpeace said its own investigation, which included analysis of satellite imagery, showed that two companies connected to Sinarmas cleared almost 8,000 hectares (19,770 acres) of forest and peatland on Borneo during the five years it was advising the family-owned conglomerate on forest conservation. The evidence shows that Sinarmas is "not genuinely serious" about stopping deforestation in Indonesia, said Kiki Taufik, head of Greenpeace's Indonesia forests campaign. "The group must immediately come clean," he said. "Stop the bulldozers and restore what was destroyed." 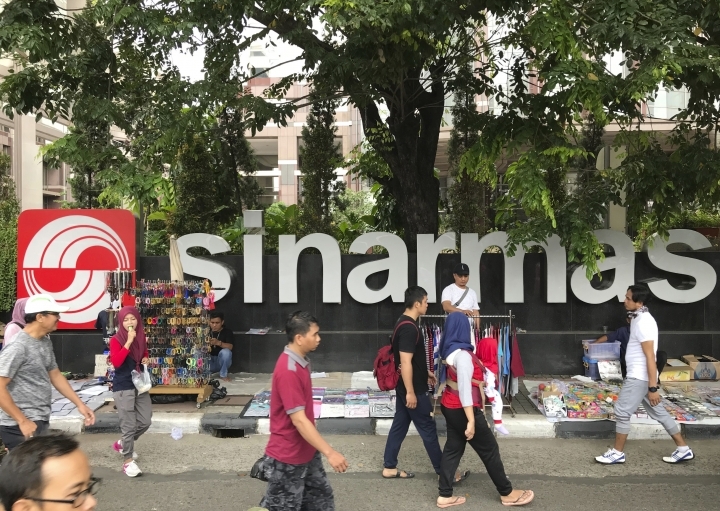 "It's only this action that can save APP and Sinarmas from further campaigns and contract cancellations by customers," he said. A statement released by Asia Pulp & Paper said it had worked over the past three months to address concerns and was "disappointed" with Greenpeace's decision. It said the companies responsible for deforestation were not under its direct control. "The fight against deforestation in Indonesia is a complex issue and not one any organization can resolve by themselves," the statement said. Indonesia is chopping down its rainforests faster than any other country, profiting paper and palm oil conglomerates while causing chronic social and environmental problems. Rapid forest loss and greenhouse gas emissions have made Indonesia the fourth biggest contributor to global warming after China, the U.S. and India. The country's emissions soared in 2015 when record dry season fires, worsened by draining of swampy peatland forests for plantations and El Nino weather conditions, burned 10,000 square miles (25,900 square kilometers) of plantations and forests. The smoke blanketed much of Indonesia, Singapore, Malaysia and southern Thailand in health-damaging haze that a Harvard and Columbia study estimated hastened 100,000 deaths. AP's investigation found extensive links between Sinarmas, its pulp and paper and forestry arms and nearly all the 27 plantation wood suppliers it had told the outside world were independent in an apparent attempt to greenwash its image. Most of the wood suppliers were based in Sinarmas offices and owned by employees of the Sinarmas group and in some cases former employees. Using drone photos and satellite images, AP reported that plantation company Muara Sungai Landak, one of the two companies now accused of deforestation by Greenpeace, had been cutting down tropical forest for several years on lands it has a government permit to exploit. The tropical wood was being turned into pellets marketed as a sustainable energy source. Government records that track levies companies pay when cutting tropical timber on such so-called concession lands also showed the deforestation taking place. Corporate records show Muara Sungai Landak is owned by two employees of Sinarmas Forestry and one of several plantation companies not included in Sinarmas' list of official suppliers but with which they share some of the same Sinarmas-linked owners. Greenpeace said its investigation showed that Muara Sungai Landak had razed nearly 3,000 hectares (7,410 acres) of forest since 2013. Sinarmas "refused to refute" evidence it was owned by its employees, it said. Asia Pulp & Paper's statement Wednesday acknowledged that employees had been shareholders of that plantation company. Plantation company Hutan Rindang Banua, which is owned by the Singapore stock exchange-listed coal mining arm of Sinarmas, has cut down nearly 5,000 hectares (12,355 acres) of forest in Borneo since 2013, according to Greenpeace. Annual reports of the Singapore-listed coal company, Golden Energy and Resources, acknowledge its Hutan Rindang Banua unit cuts down natural forest. Other environmental groups questioned Greenpeace's 2013 agreement with Sinarmas due to deep mistrust of the company given its long history of land grabs and environmental destruction. Some activists believed the Widjaja family owners of the conglomerate used the truce with Greenpeace as a shield from criticism while their business empire built a new pulp and paper mill on the island of Sumatra, that is among the world's largest and significantly increases demand for wood. The environmental group's own due diligence before entering the agreement did not find the extensive links between Sinarmas and the suppliers it characterized as independent. Greenpeace credited Sinarmas with making some progress during the five years they worked together but also said it failed to "provide a credible response or to take meaningful action" when given the findings of its investigations. "Customers and investors of APP and Sinarmas should demand they come clean about which companies they have ownership or any association with, and immediately end all deforestation by these or other companies," said Taufik. "If APP and Sinarmas do not immediately comply, then all customers should cancel contracts and walk away," he said.